The world is a terrible place to live after the zombie apocalypse, but probably for none more so than a vampire. Without humans, the blood supply is all dried up, unless you find a random animal. The buildings are decayed and in ruin, with gaping holes the sunlight streams through and providing easy access which makes a sleeping nightwalker a sitting duck for the walking dead. That’s the reality that the vampire named Coburn wakes up to -- he doesn’t know how long he slept, he just knows that he’s in an unliving hell. This is the world of Double Dead, a grim place of death, despair, and some seriously dark humor. If you’re looking for a story where the heroes rise triumphant like the storybooks say, get thee to The Dresden Files. This is a very bleak tale that begins with the world so far at the bottom of the glass half empty that there’s nowhere to go but up. Coburn is not looking to make the world a better place, he just wants a steady food supply. The few humans he finds aren’t saints either; at best they’ll make immoral decisions to survive and at worst they’re predator cannibals. This leads us to the biggest problem of the book (at least at first) -- there’s no one you really want to root for. There’s a term on the Internet called “Darkness-Induced Audience Apathy” that hits this on the head quite nicely. It means that reading a story without some form of lightheartedness or hope to hold on to becomes an unpleasant slog. Double Dead certainly feels like that at first, but it thankfully improves as the book goes on. Unfortunately, that’s not the only blood benefit going around. See, Coburn’s blood is powerful stuff on its own, giving him supernatural strength, speed, and healing when he calls on it. However, he finds out the hard way that zombies can benefit from it too. When a rotter in a bathrobe bites him on the neck and gets a mouthful of his red juice, she transforms into a hunter - fast, strong, deadly, and worst of all, intelligent. And there’s something even worse -- the hunter can command other zombies and even give them some of that blood, turning them into hunters. Here’s where we come across one of the big strengths of the book -- its own solid mythos. While the story uses common elements from zombie and vampire fiction, it also crafts its own consistent mythology that carries the story quite well. Unlike most zombie apocalypse tales, the cause of the outbreak is clearly spelled out and it fits so well into the story, you’ll spit whatever drink you had in your mouth all over the pages. Some people may draw comparisons to George A. Romero’s work or The Dresden Files, but I find this has more in common with the video game series Dead Rising. 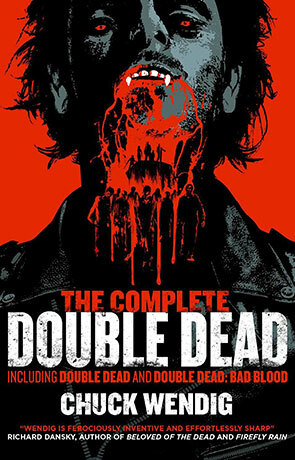 Apart from small similarities like the zombies being more aggressive at night, Double Dead brings a sense of dark goofiness to the zombie theme. The nutjob survivors that our characters encounter resemble the colorful and unique psychopaths you fight in the games. One particular case are the wannabe thugs that look like they stepped right out of an Insane Clown Posse concert, yet somehow had the capability and know how to take over a huge section of the midwest as their sovereign territory. Good protagonists need good antagonists and the ones our characters come across definitely qualify. All this is the framework that sets the scene for Coburn and the gang’s journey. Like I said, at the onset, you’ll be hard pressed to find anyone that you wanted to root for. But as the story goes on, you start to feel for even the biggest jerks in the main group, particularly Coburn. The more you discover about him, the more you realize just what a wretched soul he is. The interesting thing is that you learn about him at same pace he learns about himself, since vampires lose memories of their past lives after they’ve been turned in this story’s universe. The climax of their trip to Los Angeles is pure heart-pounding suspense and action; some characters find peace and redemption, some go out in a blaze of glory, and both Coburn’s and Kayla’s arcs come to a close in a way that answers some questions, but also opens so many doors and possibilities. You discover how tightly tied together everything in the story was, almost as if it were destiny. Now you’d think that’s where it would end, but you’d be wrong. See, The Complete Double Dead is actually two stories under one cover. Double Dead, which I’ve been describing, takes up the majority of the pages, while the rest are dedicated to a short sequel story, Bad Blood. Let’s dig in and see how that holds up. Bad Blood revolves around Coburn and Gil making their way up to San Francisco to find another lab to work on Kayla’s blood, since there were complications with the last one. They soon discover that a metropolis is one of the worst places to be in a zombie apocalypse, given the bottlenecked streets and the fact that the huge population is now predominately walking dead. While struggling there, they come across survivors old and young, more hunters… and other vampires. For the most part, the sequel is on par with the rest of the book, except we have the benefit of the characters having grown through their experiences. It’s not a slog like the early portions of Double Dead. This time, we gain even deeper insight into Coburn as he has to spend more and more time in his own psyche, due to the events in Los Angeles. Gil also becomes a more fascinating character as we see what the fires of his journey have forged him into. We also see the mutual respect that Gil and Coburn have for each other, even if it doesn’t necessarily go as far as friendship. The ending to Bad Blood is admittedly a little abrupt. We have a new revelation about the mystery of Kayla and then that’s it, our protagonists’ onward movement simply implied. However, I think this was done because this is not the end of the overall story. There are so many unanswered questions and more things to do to accomplish their goal that I am convinced more stories are to come. And to be perfectly honest, I’d be excited to read more. Despite my initial hesitations, I’ve really grown to love Chuck Wendig’s prose and found these characters to be rather engaging. I don’t know how many times zombies and vampires fighting has been done before, but this feels fresh enough to keep harvesting. Written on 13th June 2016 by Colin.